Sondheim anthologies – be it those one-night benefits (like all the recent 80th birthday celebrations), or those conceived for regular theatrical runs (“Marry Me a Little,” “Putting it Together”) – have been plentiful ever since the 1973 AMDA benefit and the 1976 “Side by Side by Sondheim.” But writer/director James Lapine has come up with a clever variant. "Sondheim on Sondheim" is peppered with clips of Sondheim himself – archival and newly filmed – ruminating on his life and work, a device which gives a uniquely autobiographical feel to the bountiful parade of songs, which include a good many rarities among the familiar hits. “Smile, Girls” from “Gypsy” and “The Wedding is Off” from “Company” are among the lesser known numbers. 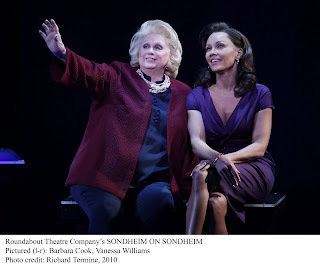 The eclectic but well chosen cast is headlined by the great Barbara Cook, Vanessa Williams, Tom Wopat, with A-level support from Euan Morton, Leslie Kritzer and Norm Lewis. On designer Beowulf Boritt’s handsome set – a revolving staircase and (in deference to Sondheim’s love of puzzles) interlocking crossword squares, under Ken Billington’s expert lighting, the ensemble cast performs numbers that spring organically from Sondheim’s commentary. So, for instance, he’ll reveal how he was persuaded to turn “Waiting for the Girls Upstairs” from a quartet to an octet, and in short order, the number is done. A confession about falling in love at last at age 60, leads to a humorous take on that paean to love, “Happiness,” from “Passion.” The composer’s assertion that “Opening Doors” is his only truly autobiographical song segues to the number itself. And so on. Terrific as all the cast members are, including, in smaller parts, Erin Mackey and Matthew Scott, Cook is the class act. Looking trim, her voice is still a marvel – pure and agile -- and no apologies whatsoever need be made for the lady’s age. Her classic “In Buddy’s Eyes” sounds as fresh as when she first sang it in the “Follies” concert at Lincoln Center, and her “Send in the Clowns” is an lovely as any version you’ve ever heard. But this no grande dame trotted out to deliver the occasional big moment. Cook is an active part of the ensemble, moving about the stage, and interacting with the others in complex medleys, including a delicious sparring version of “You Could Drive a Person Crazy” with Wopat. And she’s allowed to go into character for scenes from “Passion” and “Sunday in the Park with George.” Throughout, Lapine has given her some priceless bits of comic business to undercut any notion of a diva turn. Her entrance, which I shan’t spoil, is very funny. Williams and Wopat get the lion’s share of the other numbers, as befitting their star billing, and they’re both musical veterans with a sure grasp of Sondheim style. Williams duets most beautifully with Cook in a medley that blends “Losing My Mind” with “Not a Day Goes By,” and reprises Diana Rigg’s London “Follies” striptease, “Ah, But Underneath.” And Wopat is particularly good in “Sweeney Todd” and “Assassins” numbers. Leslie Kritzer’s high point is “Now You Know” from the same show, sung with exceptional point and clarity. Indeed, all the numbers sound fresh in this setting, backed by David Loud’s spare but classy arrangements. Mackey has a bright moment with “Do I Hear a Waltz?” – after Sondheim relates that he had promised a dying Oscar Hammerstein he’d collaborate with Richard Rodgers if the latter ever asked him -- and Scott does his “Multitude of Amys” solo very well indeed. The ensemble moved beautifully (Dan Knechtges is credited with musical staging). Some have disparaged the concept – with its copious use of clips -- as more suited to a television special, but I found the structure utterly compelling, and in its juxtaposition of the artist and his work, an extremely moving tribute to one of the, yes, gods of the musical theater.